We’re stoked for Decibel Magazine’s Metal & Beer Fest 2019, are you? If, like us, you’re planning on doing some headbanging, might as well warm up them neck muscles at Barcade, where we are throwing this METAL NIGHT extravaganza on Wednesday April 3rd! 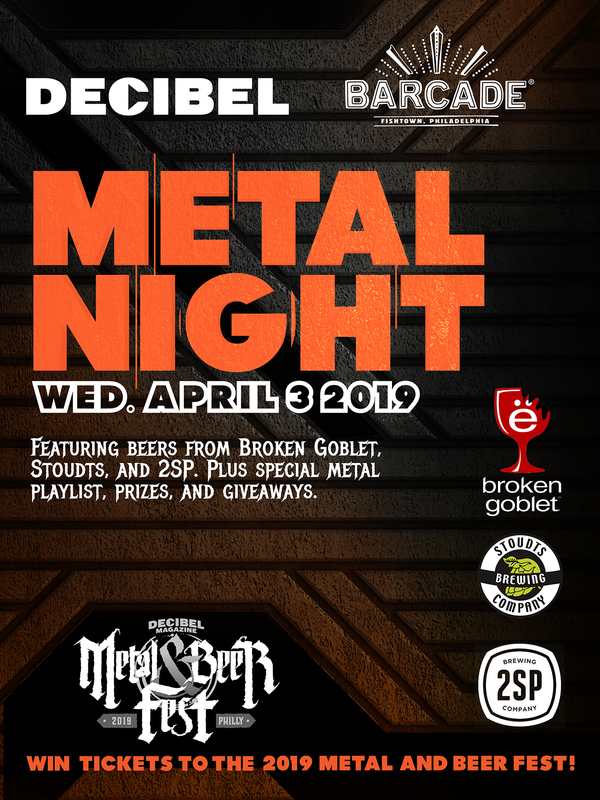 We’ll have a special all-Metal playlist cranked, great giveaways from Decibel, Barcade, presenting brewery Broken Goblet, and featured breweries 2SP and Stoudts. You could even win a pair of passes to the big show! Starting at 6pm, buy a beer from the presenting/featured breweries to receive a raffle ticket. Drawings will be held at 7, 8, and 9pm. Grand prize: 2 VIP tickets to the Decibel Metal and Beer Festival, 4/13 & 4/14! Broken Goblet Under Her Spell – 8.8% – Belgian style Saison cranked to 8.8% ABV and loaded with big banana and clove flavor. 2SP Black Mountain – 10.0% – Imperial Oatmeal Stout with aromas and flavors of dark roasted malt, caramel, cacao, and almond with a sweet finish. Black as your soul!!! 2SP Eastwood IPA – 6.8% – West Coast-style India Pale Ale with a huge hop flavor! Stoudts “Believer Reserve” Belgian-Style Tripel – 9.0% – Belgian style Tripel aged in chardonnay barrels!